One of my goals for the year was to find at least three ways to earn a little extra scratch. After all, with a new home on the horizon (fingers crossed to close on September 26!) and a wedding in the works, the budget to decorate and renovate is quickly shrinking. And, oh yeah, we shouldn't neglect that pesky thing called "saving for our future." Since early August when Bob and I worked as tent money managers at Lollapalooza, a couple other opportunities have found their way to us including working a beer tent at a streetfest and a decent paying market research/focus group opportunity for me. 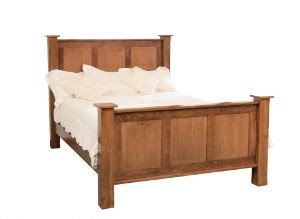 As we develop our budget for our soon-to-be-home, one of the largest items (both literally and money wise) is a king sized bed. I once read a quote that I liked that went something like "the closest something is to your skin, the more you should spend on it. This means expensive bedding and cheap drapes." A long time ago Bob and I agreed that the bed was an item we wanted to splurge on. Up the thread count on those sheets and pump up the mattress quality, it is about time after a lifetime of twin beds on metal wheeled frames and 6 years of an IKEA Malm bed that we live in the lap of luxury. Now, don't get me wrong, I loved my little MALM, but the idea of having a bed I don't have to practially lay on the floor to get into is very appealing. But with these splurges, the budget could certainly take a hit. This is where an exhausting weekend of slinging Amstel Lights and pizza slices comes in. Our money making ventures coupled with a Labor Day online coupon for a furniture store we like and a well-timed YouSwoop for Back to Bed basically ensure that our new king-sized bed will be fully paid for without dipping into our total budget for move-in projects and products. Wowza! Labor Day weekend we headed out to to a furniture store in the suburbs we had been to. I knew this weekend would bring mucho furniture store sales, so after sifting through a few websites I landed onto this one. We bought our dresser from this store and my sister has purchased a few items as well including a kitchen table and chairs and her rocker in the nursery. I remembered seeing some really high quality looking Amish made beds at the store and figured it would be worth checking out. The enticement of a trip to the suburbs grew after printing out a $200 off your purchase coupon for the weekend! After one lap in the store, our eyes fell upon it: The Amish Treasures Collection. In Cherry. With a headboard and footboard. The dark cherry wood helps make it look not so "countrified," as was the impression I got with the lighter woods. Rather than be hasty, we mulled over the decision over lunch at Chili's (true suburban experience: eating at chain restaurants) and then headed back over. With our $200 coupon applied and after taxes (oh Cook County, you certainly aren't cheap), we are ending up paying just over $1,000. I choose to believe this is a good deal for such a well made King Sized bed. We probably could have gotten additional deals and discounts if we went in for more of the bedroom set, but we don't really want/need the nightstands or dresser to perfectly match. So in about six more weeks we should hopefully be getting the call that our bed is in and we can figure out if we want to shell out $75 for delivery or if we will rent a UHaul van for the day. We have already been forewarned it will not fit in a Tahoe which is the vehicle we would have attempted to pick it up in. And with the bed you need a mattress set! For awhile we have been thinking of going the Sleep Number bed route, but I think we decided we do not need to invest that much at this point in time. A nice pillowtop number should do. Opening up my email on Sunday morning, I was shocked to see the exact type of deal that we were hoping to stumble upon: YouSwoop had $75 for $300 on a mattress set at Back to Bed. A second option was $50 for $200. After consulting Bob, I hit purchase on the $300 one. If we get the type we were already looking at, we'd be able to snag the mattress and foundation for under $1K! Now we just need to get out to a Back to Bed. . .
And of course with that mattress set will come down comforters, duvet covers, pillows (both functional and decorative) and those high thread count sheets I mentioned! I have already been perusing Overstock.com and the like for ideas. Our bedroom theme is going to be Moroccan-lite. Meaning warm colors and some patterns, but not to the point that we have lanterns hanging from the ceiling and tons of floor pillows. I shall leave you with a sneak peek at the wall color we are eyeing for this master bedroom. Keep in mind three walls of the bedroom are brick and the fourth is the drywall that makes up one side of the closet. So there will really only be an accent wall painted. 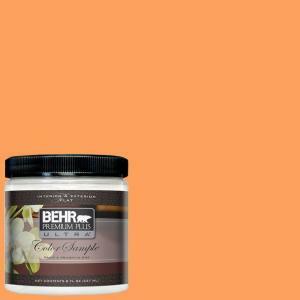 Orange Spice by Behr. The swatch looks a bit darker than it is showing on my computer screen so hopefully you aren't seeing some peachy sherbet color right now like I am! Any other paint ideas for me? What about bedding? Always looking for ideas! Such inspiring story you got here. Congratulations are in order for you! Don't forget to treat your senses before you get to your new home. I went to cheap furniture los angeles and only had amazing finds to boot.